Have you ever wondered which medicinal herbs are the best ones to start growing, but felt overwhelmed and just didn't know where to begin? There are SO many great herbs with useful properties that you can grow to create your own medicinal herb garden. Here is my own best list of medicinal herbs you should grow in your own garden and a little bit about how to grow and use your medicinal herbs. I've seen a LOT of different lists of medicinal herbs you should try to grow or at least have available on hand. I thought I'd go ahead and write about my own top 20 medicinal herbs to grow in your garden. But I have to tell you--- I had a REALLY hard time narrowing my list down to just 20. I left out Goldenseal, Juniper, Arnica, Turmeric, and many more that could have and should have made it to this list. But if I had included them all---well, this would have been a BOOK! The way I ended up narrowing this list down was based on 1) how easy the herbs are to grow, 2) how easy they are to forage or purchase for quality, and 3) their overall usefulness for multiple issues. These are herbs I use ALL the time, I can grow most of them, even in my harsh climate, and the rest I can easily purchase. If you are fortunate to live in a great gardening area, these herbs should be no problem at all for you to start out with. And if you'd like a great reference book that's fun to read, informative, and comprehensive, I suggest Rosemary Gladstar's Medicinal Herbs: A Beginner's Guide. It was the first herbal book I ever read, many many years ago, and I refer to it still with enjoyment and gratitude for her knowledge. FTC Disclosure: There are affiliate links scattered throughout this article. If you click through and make any kind of purchase, I may earn a small commission at no extra cost to you. Thank you--Heidi. Full Disclosure Here. Having an herb garden filled with medicinal plants is a good idea if you want to be prepared. But what plants and herbs should you plant in your medicinal herb garden? If you are planning on planting an herbal medicine garden this Spring, here are the BEST 20 Medicinal Herbs to choose to get your garden prepared for emergencies. Calendula is one of my top five favorite herbs of all time. It's sunny yellow or orange face can't help but make me smile. In summer time, it grows like crazy, just about anywhere, and like other flowers, the bees love it. Calendula has some super skin healing and strengthening properties, and I always have some infusing in olive oil in a sunny window for use in salves, soaps, and other body products. In fact, you can see the beautiful yellow color it made the soap in this soap recipe. Calendula is also edible, and it's so fun to toss some blooms in your salad! It really brightens things up and adds excellent color. I love Calendula. Calendula just makes you smile. Here is another herb I think should be in every garden. Cayenne is a very hot and pretty red pepper with some excellent culinary uses for adding spice to foods. It's also great for helping with circulatory problems, can be used to help stop bleeding, since it's a hemostatic herb, and has been shown to be useful in helping slow or even stop a heart attack until help can arrive. It's also a very attractive plant, and the bright red of the pepper is just gorgeous mixed Into the dark green of the plant's leaves. This is one herb you should definitely grow if you can, and have handy in your herbal medicine chest. Also, here is a recipe that uses Cayenne: How to Make a Natural Decongestant that Really Works, and you may also enjoy How to Make Fire Cider and How to Make a Pain Relief Salve for Joints and Back. Cayenne grows like crazy, especially in warmer climates. They dry well, too. Like Lavender, what would an herbal garden be without sweet Chamomile? It's honey scent and sweet taste are an absolute pleasure. Besides that....Chamomile is a popular relaxant and mild sedative herb. Need to de-stress? Drink a bit of Chamomile tea! Growing Chamomile can be tricky in very hot climates. It likes full sun, but a cooler climate. Chamomile is also best grown in less maintained soil and doesn't need the rich fertilization other plants require. Here is a recipe for my Ultimate Herbal Relaxation Tea that uses Chamomile. It's a wonderful de-stressing drink! Chickweed is another one of those "weeds" that is completely misunderstood and has some excellent medicinal qualities. It's Latin name, (stellaria) means "star," and that is because of its small, pretty starlike white flowers. It's easy to grow, and has many uses. Chickweed supports liver and kidney health due to its high nutrition and diuretic properties. It's also wonderful in salves for healing skin issues, including rashes, eczema, and very dry skin. Chickweed is one of the star ingredients in this urinary tract support tea blend. Chickweed is a great diuretic and blood purifier. This prolific weed, as some people see when they notice Dandelion in their yard, is actually a powerfully helpful medicinal herb! 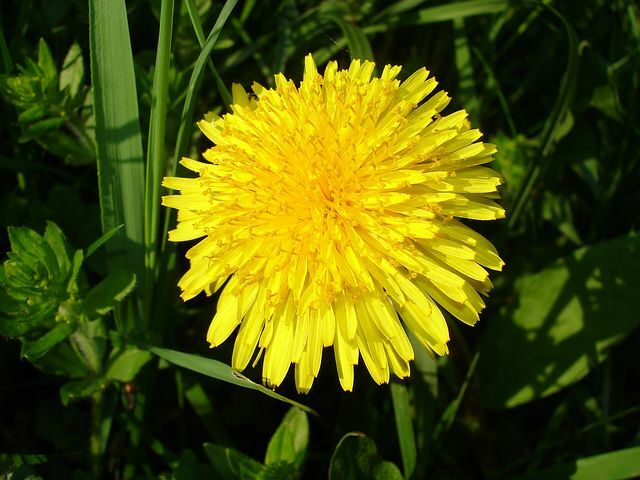 Dandelion is terrific for your liver and kidney health, having diuretic properties. It's also an edible plant! You can roast the roots and add it to teas and even your coffee for a delicious flavor that also packs a healthy punch. The leaves can be eaten in salads and other foods. Want a detoxification, blood purifying herbal tea blend? Here you go: How to Make a Liver Support Tonic Tea. Dandelion is also a star in my herbal tea for urinary tract infection prevention and healing. This little weed, Dandelion, packs a powerful healthy punch. Feverfew has lovely white flowers and at least where I live, is rather invasive. I don't mind, though, because it has a great number of medicinal benefits. As its name connotes, feverfew is helpful with reducing fevers. Most recently, however, feverfew has become rather well-known for helping with migraines, both preventing and reducing the intensity and time. One of my favorite teas to provide for people who suffer from migraines is: 1 part feverfew, 1 part spearmint, and 1 part lemon balm. This is a soothing, nervine combination, that along with the powers of feverfew, can be used as a daily tonic. Feverfew is also great for minor bug bites. Just apply the tincture topically. Since it has mild pain relieving properties, it will help with the discomfort too. Here is a recipe for my nerve soothing tincture, that is easy to make! Garlic is one of the BEST all around medicinal herbs anyone can grow, in my opinion. It's useful for treating colds, flus, sore throats, and digestive issues. Garlic boosts the immune system by increasing and stimulating the production of white blood cells. Garlic is antiseptic, anti-bacterial, and vermifuge (kills parasites). It is also useful as a blood purifier and helps promote healthy circulation. It may also help regulate blood sugar levels in those with type 2 diabetes. Besides all these wonderful benefits, garlic is delicious! It's added to so many foods and dishes because of the flavor it imparts. Granted, using garlic medicinally is different than in culinary uses, but if you really want to "eat thy medicine," as Hippocrates famously stated, garlic is a great place to start. Here's a recipe for traditional Fire Cider, one of the best immune boosting drinks you can create yourself! Oh, what would the herb world be without Ginger? This sweet and spicy pungent herb is actually a rhizome, not a root, as many believe. The useful part grows under ground, so is often confused. Ginger is stimulating and is a great additive for teas, tinctures, and fermented foods, as well as culinary uses. Ginger is anti-inflammatory, decongesting, and increases circulation, promoting warmth. Ginger is also excellent for flatulence and stomach issues, including nausea. Ginger likes a tropical environment---hot and humid. Therefore, unless you live down South, Ginger would most likely need to be grown in a green house. Here's an incredible recipe for How to Make Natural Decongestant that Really Works, How to Make and Use a Ginger Bug, and How to Make Fire Cider--A Healthy Immune Tonic Drink. What would the herbal world be without lavender? It's good for SO many things. Lavender smells wonderful, the bees love it, it's great for medicinal uses, AND it's a gorgeous flower. 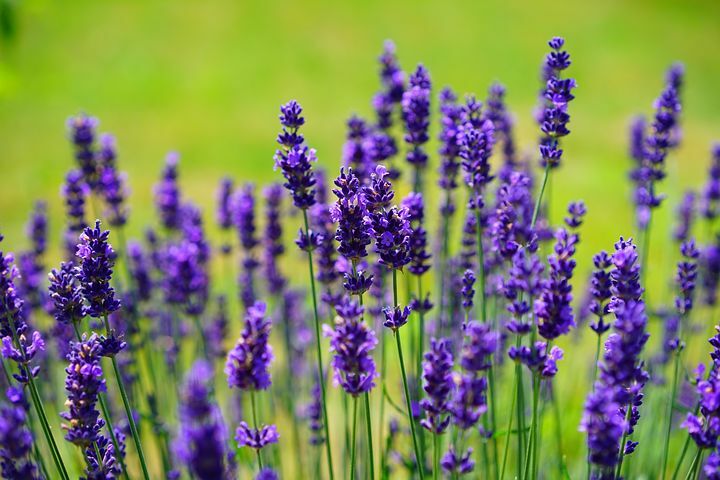 Lavender is useful for air freshening and cleaning the air or freshening closed up places such as drawers. It's popular in sachets for this reason. Lavender is actually relatively hardy, growing well in Zones 5 through 8. If you are in a colder zone, be sure to plant your lavender in an area where it will get plenty of sunshine and be as warm as possible. If your winters are rough, you'll need to provide your lavender with some type of protection, especially from harsh winds. I had some planted in pots here in the mountains, and it did very well all summer long. Even through snows, it was fine. But we get wind speeds over 125 miles an hour at times, and lavender just didn't last through that. Not much will, I guess. Here is an article about How to Make Soothing Lavender Salve I think you'll like. And if you like Lavender, here is How to Make Lavender-Rosemary Vanilla Hot Process Soap! Lavender is useful for so many things---AND it smells incredible. Lemon Balm....I LOVE this species of mint. It smells lovely, the bees love it, and it grows well nearly everywhere. Lemon Balm has a pleasant lemony taste and is a great additive in herbal teas, both for the nutritive value as well as the soothing nature and relaxing effects it has on the body. Here is a recipe for Nerve Soothing Tincture! This probably isn't included in too many herbalist's garden lists, but I think Marshmallow is seriously necessary. It's a demulcent and soothing herb, and it complements "hotter" herbs very well. It also soothes inflammation in mucous membranes and is one of my favorite herbs to use for allergy blends or teas for any kind of inflammation in the body for this reason. 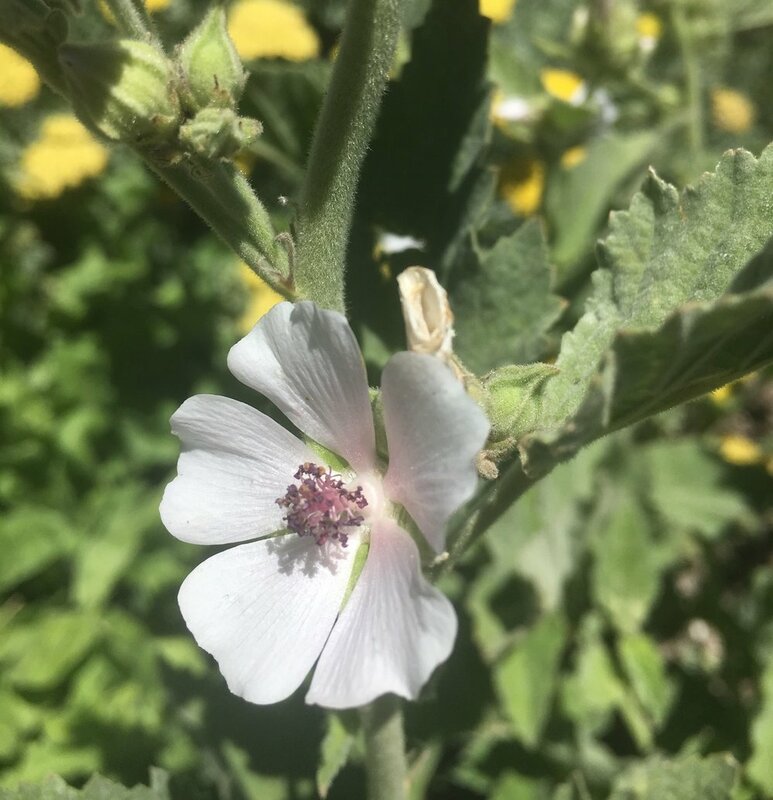 Marshmallow is an upright plant, similar to a very small hollyhock. In fact, if you can grow hollyhocks where you are---you can use it pretty much interchangeably with Marshmallow as their chemical constituents are very similar. The flowers are light pink and very pretty, too. The entire plant is edible and useful for medicinal purposes. Go ahead and throw a few flowers into your salad for a beautiful and surprising presentation! Here is an article about How to Make an Allergy & Sinus Support Tea (or Tincture) using Marshmallow. Marshmallow is a demulcent anti-inflammatory. Plus, it's pretty. This is yet another plant many see as just a weed, but has some truly wonderful medicinal qualities. 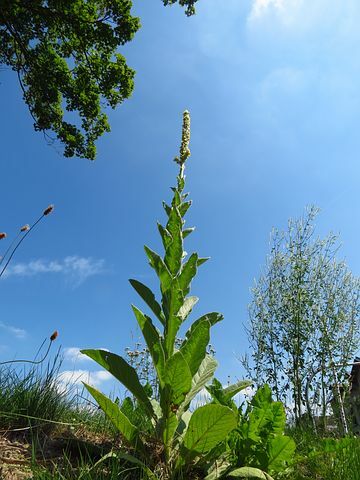 Mullein is a plant that grows from a rosette of fuzzy large leaves into a tall stalk (sometimes as high as 7 feet tall) and is covered with yellow flowers in mid-summer. Mullein does best in full sun, with lots of water, in cooler areas. It grows really well in the creek beds up here in our mountains, but I've heard it is very common in almost all places. It's worth trying to cultivate, in my opinion, if you don't have it growing naturally in your area. Mullein is one of the best herbs you can use to support and heal the respiratory system and illnesses that affect the lungs, sinuses, and breathing. It's useful as a tea, tincture, and the large leaves can be used in an emergency to cover a poultice. Here are additional articles referencing Mullein you might enjoy: DIY Allergy & Sinus Support, How to Make an Herbal Tea for Lung Support, and How to Recover from the Cold/Flu Fast and STAY Better. In my opinion, Mullein is the premier herb for respiratory issues. Oregano seems to be the bane of many gardener's existence. They plant it, and it just goes crazy. I can't tell you how many neighbors, family members, and friends have given me Oregano from their yards over the years! And I'm glad to have it! The thing with Oregano is you have to know how to manage it. Oregano is a fabulous culinary herb, and if you have ever had pizza or marinara sauce, then you've tasted this delicious Mediterranean herb. Oregano grows best in warm, dry climates, but I have found in my experience that it is quite hardy and can survive winter lows in the single digits (at least it does in my yard). Oregano (also known as Mountain of Joy in Greek) has some excellent medicinal uses, including having anti-viral, anti-biotic, anti-fungal properties, as well as being very high in anti-oxidants. It's a great skin care herb and also a digestive aid. Oregano can be used in many forms, too: As a tincture, an herbal infused oil, eaten in foods, and as an essential oil. These all have different strengths, potencies, and uses. The tincture is an easy way to use the herb medicinally, along with making or using in an herbal tea. Super easy to grow just about anywhere, Peppermint is a spreading perennial that has the propensity to take over your garden if you allow it! It's spicy, pungent scent is well known to just about everyone, since it's a popular culinary additive in many foods and candies. Medicinally, Peppermint is useful for aiding digestion and getting rid of flatulence (gas). It has mild anti-spasmodic properties, so if you are experiencing cramps, especially digestive types or menstrual cramps, it can be very helpful. You may also be interested in finding out more about How to Use Peppermint Essential Oil. Here is another weed that many people find repugnant, but that is actually an incredibly useful medicinal herb! According to Rosemary Gladstar, Plantain grows everywhere, and if you invite it in, it will definitely show up. However, I have to say that in our area here in Southern Nevada, down in the lower elevations or higher---I have not been able to grow it. This makes me feel a bit of a failure as a gardener, since it is supposed to be prolific, like Dandelion...... Maybe this upcoming year. Plantain is great for liver health, detoxifying and cleansing the blood, and drawing out toxins. I like to infuse it in oil for use in healing salves. You can find it in my recipe for Healing Salve. Like Dandelion, this easy to find weed is edible and useful. Rosemary is a famous culinary herb, and is great for use on red meats and very pungent dishes. Besides this, rosemary has been proven to be helpful for the brain, especially memory functions. It's high in anti-oxidants, and has mild analgesic (pain relief) properties. Rosemary is a stimulant herb, and is helpful with circulation and low blood pressure. People with high blood pressure need to exercise caution using rosemary medicinally. But I just love this plant, and if I ever get a greenhouse, I'll be growing it year-round if I can! Besides the actual herb, you can find out all the Things You Need to Know About Rosemary Essential Oil right here. Besides being a pungent and delicious culinary herb, rosemary provides medicinal qualities and enhances memory. St. John's Wort is a misunderstood plant, in my opinion. It went through a popular phase a few years ago and was touted as being the new natural anti-depressant. St. John's Wort can absolutely help with feelings of mild depression, sadness, grief, and Seasonal Affective Disorder (SAD), but it's not a cure-all. Important to know---St. John's Wort can interact with certain drugs, so be sure you discuss usage with your doctor (as you should with any of these herbs mentioned). St. John's Wort is also great for neuralgia, and I personally use it as part of my back pain and sciatica regimen with excellent results. I also use it in a tincture form to lift my spirits if I'm feeling down. Besides all the medicinal qualities of St. John's Wort, it's a really pretty plant. You won't be able to grow it in a super hot area, however, at least it's unlikely. I tried growing it in Las Vegas, and it was a total fail. However, it does well here in the mountains in full sun or partial shade and the cooler climate. One of my favorite ways to prepare St. John's Wort is as an herbal infused oil. The medicinal species (H. perforatum) releases bright red juices into the oil, creating the most lovely infused oil. You can find out How to Make an Infused Herbal Oil here, as well as How to Make Happiness Tea Blend (which is wonderful!). Also, here is a recipe for How to Make St. John's Healing Salve---one of my favorite salves ever. Another safety note for the garden: St. John's Wort has been shown to have potential for phototoxicity, especially in grazing animals if they eat too much. Just be aware and watch what your pastured animals eat. St. John's Wort is a wonderful healing herb that positively affects the emotions. Thyme, in my opinion, is one of the best plants to use in your garden. It attracts bees, smells lovely, and is incredibly useful for medicinal purposes. It's a small, spreading herb (although some species will grow upright) that is fairly hardy, so if you have rough winters, it may do just fine---you'll be seeing it again in the Spring, with it's pretty scented purple flowers. Many herbalists forget all about using thyme as a preventative medicinal herb or for helping heal quickly from colds and flus---but it has been shown to fight off colds. It also has disinfectant properties, and can be used as an effective wash for skin infections or as great sore throat rinse. For medicinal purposes, Thymus vulgaris or Thymus citriodorus (Lemon Thyme) are the best to use. Find out how to boost your child's immune system with thyme infused honey in this article. This stately flowering plant can grow to about four feet tall and has lacy white flower clusters. Not only is it a lovely addition to your garden, but it is very useful. It's a strong but safe sedative and is very useful for helping with anxious feelings, sleep issues, and pain relief. I use Valerian very often because of its powerful nervine properties, and you can see my recipe for How to Make a Sleep Tincture right here. It works! Contraindications: Valerian has the opposite effect on some people, so if you are using it for the first time, do so on a the eve of a day that won't affect you much. These folks are rare, but there are definitely some that don't tolerate it well. One of nature's best gifts---Valerian is lovely and it is an excellent safe sedative. Yarrow has many tiny flowers that grow in bunches, and feathery grayish leaves. It's a very pretty plant for your garden. Besides, the parts that grow above ground (leaves, stems, flowers) have medicinal purposes and have been used for thousands of years. Yarrow is a vulnerary, hemostatic herb. Besides helping with healing and clotting of wounds, yarrow is good for helping reduce fevers, hay fever, and fighting colds. As a fever reducer, it is important to note that yarrow induces sweating, so if the person already has a hot fever, yarrow is probably not the best choice to use. You can find out more in these articles: Herbs & Natural Remedies for Symptoms of Colds and Flu (fever, sore throat, congestion, and cough). And if you are interested in finding out How to Stop Bleeding Fast with Herbs, you'll also find out more about how to use yarrow in that article. Known as the Battlefield Flower during the Civil War times, Yarrow is useful for helping clot wounds and healing injuries, among many other things. There are so many great herbs to choose from when you are deciding what to plant in your herb garden, especially when it comes to medicinal herbs. How to choose? Well, think about your own family's needs. Then understand your planting zone and what grows well and what doesn't. Do you need a greenhouse or a special micro-climate for any of these herbs? If you're not sure, that's ok! You may have to do some experimenting, but you will figure it out---I promise. The 20 medicinal herbs I listed here are generally easy to grow, extremely useful, and also beautiful to look at! Get those seeds started soon! Or see if you can order seedlings already started, as many nurseries carry a decent selection of herbs that double between medicinal and culinary (like lemon thyme, oregano, rosemary, cayenne, and lots more). If you want just the best book to get started I have ever found, one I've been reading and referring to for years, and you are either just beginning your herbal studies or are a seasoned herbalist, you need Rosemary Gladstar's book: Medicinal Herbs: A Beginner's Guide. It's fun to read, clear, comprehensive, and an outstanding reference! Oh! And if you need to purchase your medicinal herbs to get started right away with your herbal medicine chest, then I have to tell you my favorite place to purchase my herbs is Starwest Botanicals. Have fun with your gardening this year! Do you plant herbs? What are your choices? If you have a favorite that's not here, please leave a comment in the comments section! P.S. If you haven't yet, please sign up for our newsletter! You'll never miss a thing, and you’ll get immediate access to the free Resource Library! You’ll love what’s there! P.P.S. If you are ready to start learning more about herbalism and want to explore excellent courses, I suggest The Herbal Academy of New England. They have a course for every level and even courses for specific topics, like herbal fermentation. I love this school! DISCLAIMER: I am not a medical doctor, and in no manner, stated or implied, is any statement made in this article meant to treat, cure, diagnose, or prevent any illness. Please seek medical advice from a professional before using herbs or essential oils. These statements have not been evaluated by the FDA. Gladstar, Rosemary. Medicinal Herbs: A Beginner's Guide. Which medicinal herbs should you start growing? Which herbs are best to grow for your own herbal apothecary? Find out how to start your own medicinal herb garden. Click to find out which herbs you should plant now for your own medical kit. Have you ever wondered if you could grow your own plant medicine garden? Well, you can! Here are 20 easy to grow herbs that look great in your garden and will provide you with medicinal properties to keep you healthy and well! It's fun to grow your own apothecary in your own yard or in pots.